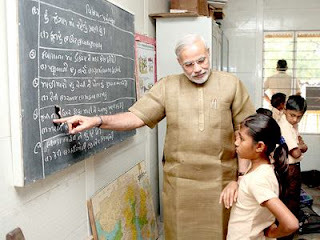 Narendra Modi who started as a "Sangh Pracharak" worked selflessly and with full dedication for RSS, to which he was attached since his school days. Narendra Modi officially entered BJP in 1987 and from then on, he struggled to achieve the desired position in the party. Narendra Modi journey from Gujarat to Delhi had started with the "Sadbhavna Upvas". He started his "Upvas" (fast) from 17th September, This fast stretched to 19th September (6PM). This "Sadbhavna Upvas" gave Modi a new name and fame in the country. Narendra Bhai Modi called everyone, irrespective of caste, religion and background, all were invited. This Sadbhavna Upvas also helped Modi to know members of his party and to know their stand for him, if he be chosen as the candidate for PM from BJP. From then on, Narendra Modi never seen back and with his growth model of Gujarat went on moving from state to state and countries to countries to become a global phenomenon. Now Modi has became a phenomenon and Modi supporters or better call them ardent supporters or Modi Maniacs are in majority. The wave of Narendra Modi is all round the country and everyone now wants to see him as the PM of the country, whether in support or opposition. Supporters wants to see him as PM because he has shown a growth model in his state and they want him to replicate the same in the entire nation and others wants to see him or better say test him, how he performs when it comes to center. Narendra Modi on Engineers day 15th september:"Engineers are the prime builders of technology, our nation and our economy. As India Develops, they have an even bigger role to play. Wishing all engineers, a very Happy Engineer's Day!" Some recent News of Narendra Modi:"The Supreme Court of India found no evidence of direct involvement by Modi in the 2002 Gulbarg riots case and the murder of Ehsan Jafri during the 2002 Gujarat violence in September 2011". US Report on Narendra Modis Governance: The efforts of 6 crore Gujaratis have been fetching recognition from different quarters, almost on a daily basis now. A recent US Congressional report has hailed Gujarat as the best in governance & impressive development in India. It also observes that we have streamlined economic processes,removing red tape and curtailing corruption. Jay Jay Garvi Gujarat. It may be noted that, it is the same US who had stopped Narendra Modi twice visiting USA, saying him the "Enemy of Humanity"
Narendra Damodardas Modi born 17 September 1950 is the current Chief Minister of the Indian state of Gujarat. Born in a middle class family in Vadnagar, a member of Rashtriya Swayamsevak Sangh since childhood, and an active politician since early in life having a masters degree in political science. In 1998, he was chosen by the leader of the BJP, L K Advani to direct the election campaign in Gujarat as well as Himachal Pradesh.He became Gujarat's Chief Minister in October 2001.